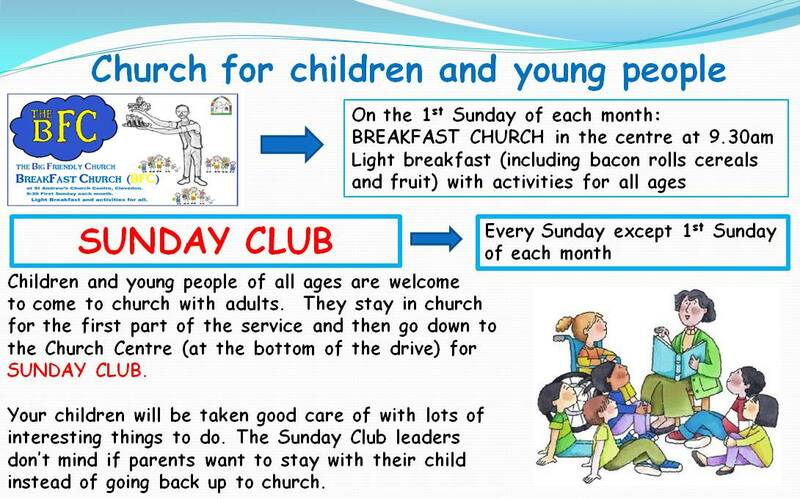 Children of all ages are welcome to come to church with adults, and they stay in for the start of the service, until it is time to go down to the Church Centre for Sunday Club. Your children will be taken good care of and given interesting things to do, but the Sunday Club leaders don't mind if parents want to stay with their child instead of going back up to church. Please note that the 09:30 service on the first Sunday of each month is BREAKFAST CHURCH (BFC) and is specially designed for families with children. This service is held in the St Andrew's Church Centre (just down the hill from the church) and is a great way to meet the other mums and dads and their children!